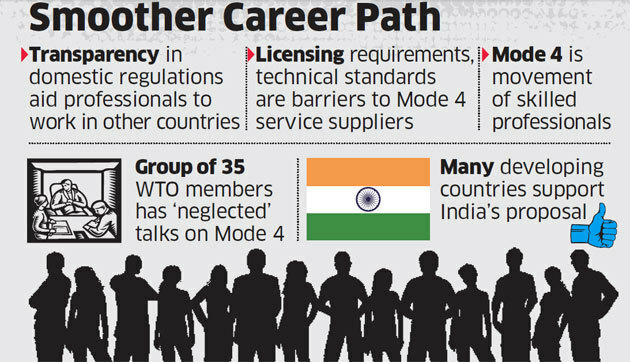 New Delhi: India sought to revive discussions at the World Trade Organization (WTO) on recognition of educational qualifications and licences for professionals to provide services in other countries, called domestic regulation in trade parlance. New Delhi wants countries to ensure that their competent authorities take account of qualifications and licences acquired by other WTO members on the basis of equivalency of education, experience and examination requirements . It has sought discussions and disciplines on licensing requirements and procedures, technical standards and qualification requirements so that they do not constitute unnecessary barriers to trade in services. “This is an effort by India to rejuvenate and reenergise (the topic) which has not seen discussions in 2018,” India said as it listed qualification requirements, licensing requirements and technical standards as barriers to Mode 4 service suppliers. A group of 35 WTO members including China, the European Union, Australia, Japan and Russia had last year formed a plurilateral on services domestic regulation at the ministerial conference in Buenos Aires. Mode 4 or movement of natural persons is one of the four ways through which services can be supplied internationally. It includes movement of natural persons such as independent professionals, and is of key interest of India. “This issue has moved to the plurilaterals but developed countries do not engage on Mode 4,” said an official in the know of the details. India said that Mode 4 is the most important mode of export interest for most developing countries including least developed countries. “Unfortunately, it is most neglected and therefore needs facilitation through domestic regulation disciplines,” it told the organisation. India had set the ball rolling for discussions through its submission two weeks ago in which it detailed the transparency requirements for all such barriers. It has recommended procedures relating to appeals or reviews of applications, ways to amend or renew authorisation and licences to supply a service, the indicative timeframe for processing of an application, publishing in advance the applications that countries plan to adopt and processes relating to appeals or reviews of applications, among others. Though India wants to get Mode 4 issues discussed, which is a pragmatic approach as many developing countries have similar issues, experts have questioned the bargaining chip that the country may have in order to get talks started on the issue.